It wasn’t supposed to be like this. Five years earlier, Reco had been excited to start his own family. He had a good relationship and a full-time job. He was raising his newborn son BJahn and paying his bills. Now he had two sons, unreliable part-time work, and trouble making ends meet. BJahn’s mother had moved back to Alabama, taking her son. Reco’s younger son, RJ, wound up in foster care. He had barely begun to win custody of RJ when the fight to get custody of BJahn from his mother out of state began. Reco hardly had time to work. Unable to pay rent, he and RJ were evicted from his apartment and began living in his car. After months of homelessness, moving between his car and shelters, Reco realized he had hit rock bottom. Overwhelmed, he decided the only thing that mattered was RJ’s safety and well being. He swallowed his pride. He asked for help. "I’m in a healthy state. I can provide for myself and my kids. Imagine LA was a big part of that, a great big part of it… I’m gonna be OK."
In transitional housing, a caseworker helped Reco enroll in parenting classes, gain custody of his older son, and find permanent housing. He knew that for his sons’ sake he had to make it work. That’s when his caseworker referred him to Imagine LA. After fighting on his own for so long, letting a team of helpful strangers into his life wasn’t easy. “Why do you need to know my business?” he would ask. But with guidance and trust, he opened his home, and his Imagine LA mentors and tutors became like a second family. 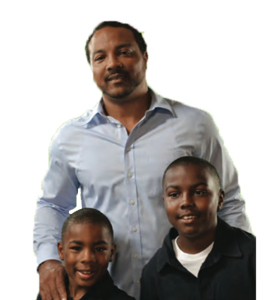 His Imagine LA team helped Reco understand that the work he had put into getting his kids back and rebuilding their life as a family left him with valuable skills that he could bring to a career. With their help, he got a full-time job at the Department of Children and Family Services (DCFS). Today, he helps families who have been through similar experiences.